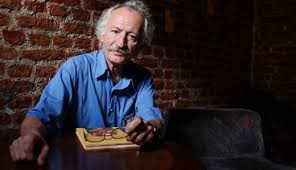 Bilgin Adalı (1944, Safranbolu – 2012, Istanbul) studied Journalism at Ankara Political Sciences Graduate School. From 1968 to 1976, he broadcast documentaries on the War of Independence, Atatürk and his reforms, culture and art programmes, as well as children’s and youth programmes on TRT Ankara Television as one of its first directors. He had begun writing poems and short stories during his primary school years, and the texts he wrote while reading at highschool were published in literary magazines. In 1976, he became an instructor at Dokuz Eylül University’s Department of Fine Arts, Cinema and TV, and later became the president of that department. When he left the university in 1984 and went to Istanbul, he continued working for advertising companies, writing scripts and children’s books.